This book contains the expertly-edited wartime journal of Revd. Alexander Reynolds, Royal Army Chaplains' Department. Among the millions of personnel who served in the north-west European campaign of 1944-5 were hundreds of military chaplains. Almost uniquely, despite the fact that they often worked at or close to the front lines, they went to war entirely unarmed. Twenty British Army chaplains died in Normandy, and many others bore the psychological scars of their experiences for the rest of their life. This book contains the wartime journal of one of them, Revd. Alexander (‘Sandy') Reynolds, Royal Army Chaplains' Department. The book casts new light on the human experience of the Normandy campaign, the Allied advance towards the Reich, and post-war occupation duties in a defeated Germany. Reynolds' journal is expertly edited by Dr. Simon Trew, Sandhurst historian and an acknowledged authority on the Normandy campaign. 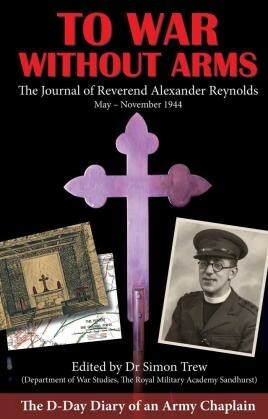 Reynolds's journal provides vivid insights into the everyday experience of British military chaplains in Normandy and throughout the north-west European campaign of 1944-5. During his first week in France, Reynolds personally helped bury around 200 British and German soldiers who died during the D-Day assault. A humane, honest and thoughtful witness of some of the most dramatic events in 20th-Century history, in this book Reynolds tells the story of the campaign in his own words.